Today was a busy but rewarding day. Mr Pandian (Sharmilla’s father) kindly arranged for me to meet some very experienced Tamil Pastors and then to be taken out to see some Lutheran churches in villages way out of Chennai. This was one of those experiences which is what my sabbatical is all about. 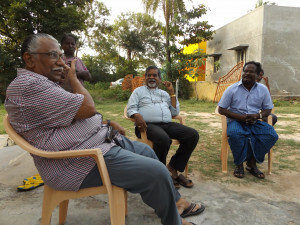 It was wonderful to sit down with these men and ask them to distill decades of gospel ministry in Tamil Nadu. They answered all my questions admirably and gave a really detailed snap-shot of the state of the Tamil church in India. Of course there were generalizations and I’m sure I will not be able to reflect exactly what they said but invaluable none the less. Future posts will try to reflect on what they said and begin to apply it to the UK context. Overall their view of the church in India resonated with my view of the church in the UK. I think the issues are slightly more exaggerated than in the UK and there are many cultural differences but the broad brush strokes still hold. Overall the mainline churches are in a mess. There are some great exceptions but the mainline churches are characterised by nominalism. Their main priority is maintaining tradition and social control. They still play a central part in local communities – essential for hatching, matching and dispatching. However, that is all that matters. Pastors are only interested in status and the church members only care about maintaining their cultural identity. In one village we visited I was told that the whole village are Christian with the exception of one or two Hindu families. The reason for this was that about 100 years ago the Church bought land for the villagers (for free) and so they all became Christian. I don’t speak Tamil and so I cannot judge whether their faith was genuine or not, but it did feel as if the church was just about keeping the village identity going. On the other hand the new churches, which are mostly Pentecostal, are growing, some rapidly. In these churches faith is real and personal. “If you are sick you call the Pentecostal Pastor – he will pray for healing.” Likewise he will visit the elderly and preach the gospel. It is not all good news here either though. These churches are often heavily influenced by the prosperity gospel and frequently combust with a nasty split. Although they do more evangelism than the mainline churches most of their growth is transfer from traditional churches. Therefore many Tamil Christians belong to two churches – a mainline church in order to be a respectable member of the community and a Pentecostal church for their faith to grow.